In addition to learning about Ridgeland through the city’s website, you may choose to visit the following websites, depending on your interests. The mission of the City of Ridgeland Chamber of Commerce is to encourage an economic environment conducive to the continuing development of new and existing business. 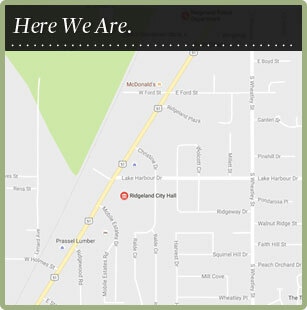 Visit our local chamber website: City of Ridgeland Chamber of Commerce. The Ridgeland Public Library has a warm and welcoming atmosphere. The staff is friendly, polite, and ready to serve everyone who comes in. The Ridgeland Library staff provides quality service in a fair and accommodating manner. The library plays a large and important role in promoting early literacy by offering multiple different programs and activities, such as story times and other organized activity groups. As a free place, open to all, the library’s diverse programs encourage reading, lifetime learning, and support all age groups in our community. The library offers public access to computers, the Internet, WiFi, scanning and fax services, and free computer instructional classes. Through the eLibrary services, you can download free eBooks, audiobooks, and online magazines. For information on events and programs offered at the library, visit mcls.ms. If you are looking for where to eat, what to do, and where to stay in Ridgeland, the Ridgeland Tourism Commission is here to help you. Visit our local tourism commission website: Ridgeland Tourism Commission. Ridgeland Beautiful, an affiliate of Keep America Beautiful, seeks to keep Ridgeland a clean and beautiful place by engaging individuals to take greater responsibility for improving their community environment. Vibrant communities have clean public places, reduce waste and increase recycling, generate a positive impact on the local economy and inspire generations of environmental stewards. Keep Ridgeland Beautiful became an affiliate of Keep America Beautiful on Feb. 25, 2014. The members wish to thank Keep Mississippi Beautiful for their guidance during the process of becoming an affiliate. Less than two years after affiliation, Keep Ridgeland Beautiful received the William (Bill) Nash Award from Keep America Beautiful. The Bill Nash Award is given for excellence in implementation of the Keep America Beautiful system in an affiliate’s first 3 years. It is one of the highest awards given by Keep America Beautiful. Membership in the Society is open to any individuals who are interested in collecting, discovering, and preserving items, photographs, and/or stories of historical interest pertinent to the City of Ridgeland. The Society meets at the Ridgeland Public Library, 397 Highway 51 on the third Thursday of the month at 11 a.m. Annual dues are $18.99 for membership, however, meetings are open to any interested member of the public. The specific mission of the Society shall be to identify historical sites and artifacts; gather and archive photographs, written and oral histories; encourage preservation efforts; educate its members and the community as to the benefits of preservation; to cooperate in projects and activities that promote and sustain a general interest in history. A History Brochure was developed by the Historical Society of Ridgeland, the City of Ridgeland, and Ridgeland Tourism Commission to provide visitors and residents a glimpse into Ridgeland’s history and significant historical sites. Bicycling is a popular activity in Ridgeland where there is no shortage of great places to ride. In Ridgeland, we are fortunate to offer bicyclists the following: designated bike routes including the Natchez Trace Parkway and Highland Colony Parkway, over 14 miles of the Ridgeland Multiuse Trail, and bike lanes at various locations including one over the Ross Barnett Reservoir to connect with a multiuse trail system in Rankin County. Ridgeland is also home to the state’s only BMX track, MagRidge BMX. Local bike shops and two organizations, the Jackson Metro Cyclists and the Tri-County Mountain Bike Association, offer group rides on a regular basis. The Mayor of Ridgeland is an avid cyclist, averaging 6000 miles per year. Mayor Gene McGee personally leads group rides several times per week. His rides meet at the Parkway Information Cabin. Bike shop rides leave from their retail locations at Indian Cycle located on Pear Orchard Road, and the Bike Crossing located on W. Jackson Street. Both shops are located adjacent to the Ridgeland Multiuse Trail. Over 10 miles of mountain bike trails, Ridgeland Trails, are located on property owned by the City of Ridgeland off Giles Lane in Madison County. The Tri-County Mountain Bike Association maintains the trails. Mag Ridge BMX Park is located in Ridgeland at 338 NE Madison Drive. It is operated by Magnolia Ridge BMX. Helmets are required on all public trails and roads in Ridgeland. Sharing the road safely is promoted by the City of Ridgeland through publicity campaigns, signage and education. See the Share the Road video from Bike Walk Mississippi to learn more.